Picasa was Google's primary photo app for many years. Picasa was both a desktop app for Mac and Windows and an online photo gallery. Picasa was originally acquired by Google in 2004 as a compliment to Blogger. It's been clear for a while that Picasa has not seen significant new features and would eventually be replaced by Google Photos. That day is officially here, and Google is killing off both Picasa and Picasa Web Albums. Picasa comes from the age of Flickr, and it's clear today that modern users want an app that connects to their social networks, is easy to use on a mobile device and allows for editing photos online. 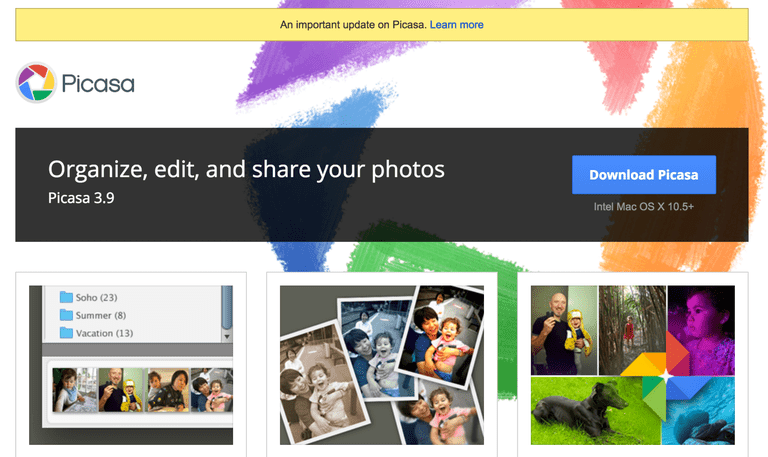 Google Photos branched off of Google+ as a photo sharing service. Google Photos allows quick photo searching, classifying, and grouping. Google Photos also allows limited photo editing to apply filters and frames, crop images, and add some minor photo tweaking. Essentially, Google Photos is focussing on the rapid change of how we use photos and will work to make it easier for users to quickly edit and share them than Picasa did. Panoramas can be stitched together from a series of photos. Animations can be created from a series of photos taken at about the same time. Multiple portraits can be arranged in a "photo-booth" style photo arrangement. Photo arrangements can be created to mark memories, such as "one year ago" or "two years ago." Holiday-themed special effects, such as adding hearts for Valentine's day or adding skeletons or other spooky features for Halloween. Photos around an event or location can be stitched together into an interactive story collection. The big weakness of Picasa (other than depending on a combination desktop and online app) is that it never really allowed for proper, modern sharing. This is not a problem with Google Photos. You can share with Twitter, Google+, and Facebook. You can also create albums with links that you can use to share, just like you could with Picasa Web Albums. As other social networks gain popularity, Google Photos will likely keep adding sharing functions. One of the most useful features of the Picasa desktop app is that it allowed you to automatically backup photos from your desktop. If you have a digital camera, and you like to preview your vacation photos on your laptop, this is extremely handy. Fear not, you still get the basic functionality using the Google Photos uploader. If you've soured to Google at this point, you can do the same thing with Flickr, but I don't give Flickr long survival odds at this point. To be specific, Google Photos backs up a "high quality" photo but not a full resolution photo, unless you specify it. Full resolution photos will cost you extra storage money, but you can keep the originals on your hard drive or back them up in some other way. If you've been relying on backups from your phone, no problem. Google Photos has been duplicating them in both spots. Your transition will be smooth. Google Photos has you covered. Well, mostly. You can crop, make minor adjustments, and add filters. To add contrast, put on a strange color filter, you'll have no problem. However, you can't do advanced effects like editing out blemishes. It may not stay this way forever, Google purchased and killed Picnik, a powerful, online photo editing app that allowed for a lot more functions than Google Photos. Google also owns Snapseed, a powerful mobile photo editing app. Flickr provides a reasonably parallel experience if you're used to features of Picasa. Both allow (or allowed) labels, albums, printing, and geotagging (associating a geographic location with a photo, which is often done automatically by phone cameras and other devices). You can print photos or order online prints from either app, and you can bulk upload your photos, embed them, create communities, and add comments. You can specify Creative Commons licenses or retain all copyright protections for your works with easy settings that you can change on a site-wide or per photo basis. Flickr is an established player. It's been around for longer, and it's still used by a lot of serious photographers. However, Flickr was recently acquired by SmugMug from Yahoo!, which has been suffering from years of decline. There's no certainty that Flickr will live much longer than Picasa, and once it goes, there may not be a clear migration path to move your photos to another service.